Though Japanese pen company Sailor makes a wide range of pens, and releases new special editions on a near-monthly basis, most of these pens feature gold nibs and, accordingly, a relatively high price point. Over the past year or so, this has started to change somewhat, as pens that were previously Japan-only have found their way into worldwide circulation, including steel-nib models such as the pen that I'm reviewing today, the Reglus. I was perhaps most happy to see that Sailor has incorporated into the "Night Black" and brown Reglus models the same ion-plated black trim that it uses on the Pro Gear Imperial Black and the 1911 Black Luster. Overall, the Reglus exceeded my expectations, and offers a high-end Sailor writing experience at a very reasonable price point. The Reglus is a Sailor pen, so of course it's well made. The biggest thing to note is that the Reglus is significantly slimmer than any other pen from Sailor that I've used, including the 1911 Standard or the Pro Gear Slim. 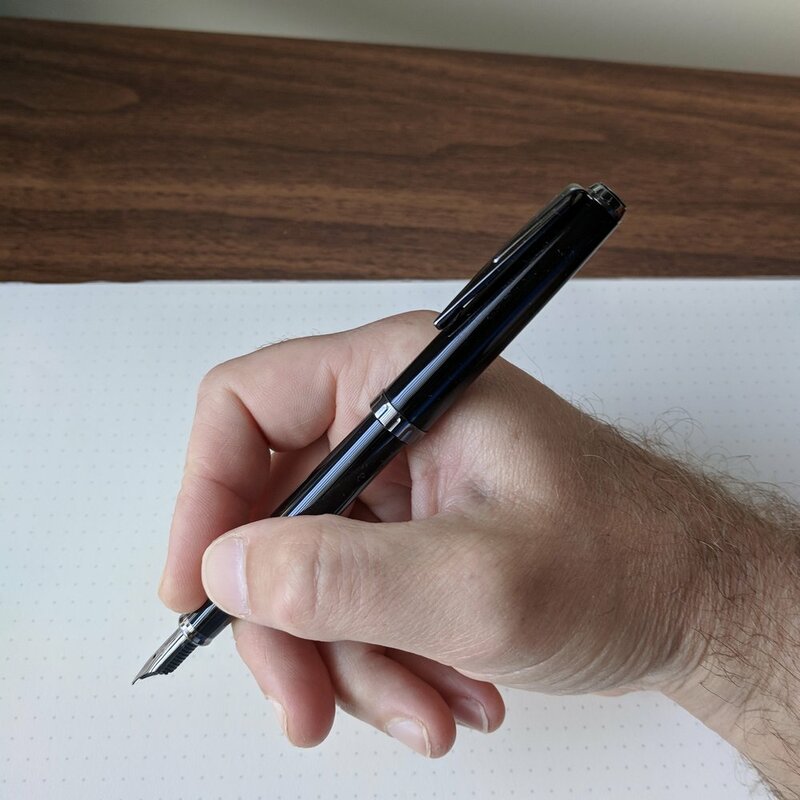 The girth will probably determine whether you like this pen - if you have larger hands or prefer a more substantial writing instrument, you may want to stick with the Pro Gear or 1911 lines, or even the ProColor if you prefer a steel nib. Personally, I've found the Reglus to be a comfortable writer, though I do use it posted to give the pen better weight and balance. Sometimes a slimmer pen is a handy tool to have in the arsenal, because it fits in notebook/planner pen loops and is more portable for certain situations. As far as steel nibs go, the medium ion-plated steel nib on the Reglus is outstanding. It's firm and smooth, and I dare say I can't tell too much of a difference between the steel nib on the Reglus and some Sailor 14k nibs I've used in the past. (Another pen I've reviewed that features Sailor stainless steel nibs is the Taccia Spectrum.) As you would expect at this price point, and from Sailor in general, this is a cartridge-converter pen that uses the typical Sailor proprietary converter. The nib on the Sailor Reglus is slightly smaller than the typical 1911/Pro Gear nibs, and has a different, slightly more understated, engraving. I like the look! The Reglus is a welcome addition to Sailor's lineup, and I hope it becomes more widely available. Sailor's nib technology continues to impress me, and it's great to see that they can largely duplicate the smooth, firm writing experience of their gold nibs in a stainless-steel package. This pen would be a great option for someone tempted by the Pro Gear Imperial Black or Black Luster fountain pens, but who doesn't want to spend at the $200-400 price point. Be aware, however, that it is a slimmer pen than either of those two models. Currently, one of the few retailers who stocks this particular model is The Pen Company, who graciously sent me this pen for review. The Reglus is available in several colors: black or brown with black ion-plated trim, or black, white, bordeaux, or blue with rhodium-plated trim. The black-trim models cost around $100 USD, with the standard rhodium trim versions running around $89 USD, though prices may vary with the exchange rate. Many thanks to The Pen Company for making this review possible! Disclaimer: The pen featured in this review was sent to me free of charge by The Pen Company for review purposes. I was not otherwise compensated for this review.